On September 11th 2001, an act of terrorism destroyed two tall towers in New York City while thousands of civilians were trapped inside. This catastrophe left the American heart profoundly wounded, yet ignited a fierce national pride along with a resolve to embrace life fully. The images in this essay focus on the emotions of the living, and bear witness to their grief and their aspirations in the weeks that followed. Most of the photographs were made in Union Square, where memorial candles burned, and flyers with faces of the missing were posted. New Yorkers gathered there to walk in silence, offer flowers, and absorb the immensity of this event. The solemnity of the activities transformed the square into hallowed ground, giving people permission to cry and hug one another there. As the vigil continued, citizens from across the country came to pay homage, to pray, and tape life-affirming messages on the surrounding fences. Thousands of candles burned twenty-four hours a day, infusing the air with the heavy scent of melting wax. The odor took me to Portugal, where I had been years earlier, photographing pilgrims who came to pray at the shrine of Fatima. Emigrants make up the fabric of America. Whatever their country of origin or individual belief, once here, they are integrated into the American family. When this massacre occurred, every person experienced a direct loss, as if a member of their own family was among the dead. Because of America’s ethnic diversity, the attack was not against America but against the global human family. As the towers fell, New Yorkers rose up. This extraordinary event unleashed expressions of civility and philanthropy that were truly transforming. While we may not comprehend the forces that caused men in their prime to incinerate their bodies along with thousands of innocent civilians, we take comfort in the countless acts of generosity and kindness displayed by ordinary people in the aftermath of this tragedy. With each new hour, yet another story emerges of how one individual made a difference in the life of another. Each deed, let loose by the better angels of our nature, is a victory over fear, and affirms a power far greater than the darkness of that horrific Tuesday. The effects of this collective goodness continues to eclipse the dark clouds of that day. These photographs were made in honor of this human nobility, and as such, form a prayer, reminding us that life is exquisitely fragile. Through simple deeds of kindness, we honor the fallen heroes, sanctify the memory of the innocent, and help repair a broken world. Union Square; A Harvest of Grief and Hope . 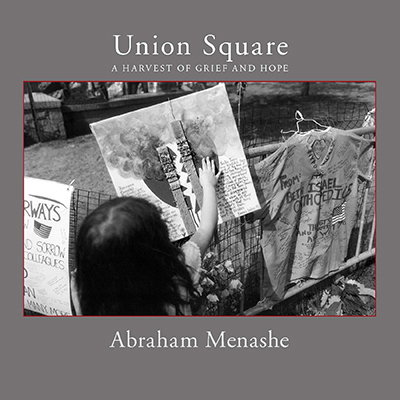 Photographs by Abraham Menashe, available from iTunes.